What is the colour of Martian sky? 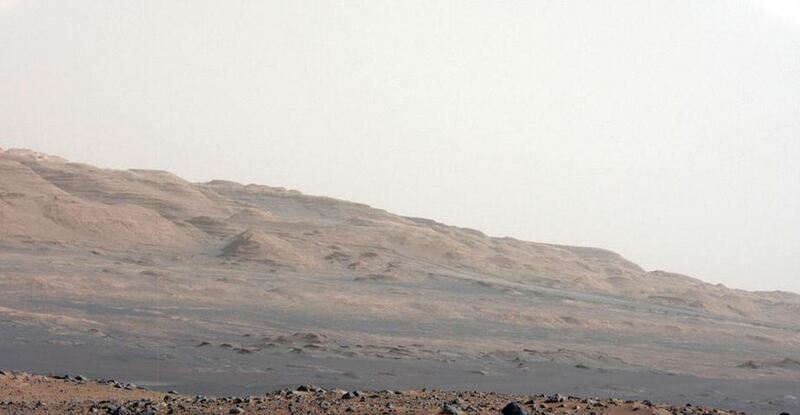 The panorama of "Marathon Valley" made by Opportunity rover (credits: mars.nasa.gov). The Mars Exploration program has been launching around 20 years since first probe Mars Pathfinder done by NASA landed on the Red’s Planet surface. For this time another four rovers touched down the Martian ground: Spirit & Opportunity (2004), Phoenix (2008) and Curiosity (2012). All of those missions beamed many photos of the Red Planet environment. Among a tens photos available on the main Mars I selected those, which presents the biggest fragments of the Martian sky. Everyone saw the sky on Earth. Our sky appears blue because air scatters more blue wavelengths than red. This is a result of the scattering of sunlight. During the day a blue color is perceived by the human eye. 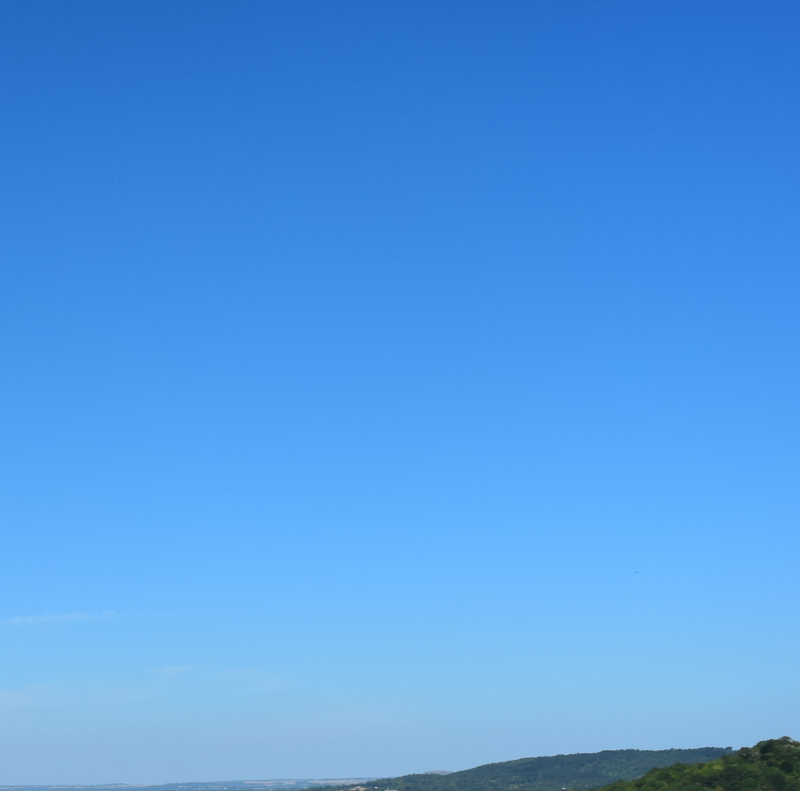 On the typical sunny day Earth’s sky blue gradient is the darkest in the zenith and light near the horizon (pic. 1). This is because light that comes overhead encounters 1/38 of the air mass that light coming along a horizon path encounters. Pic. 1 Earth’s sky is darker near to the zenith and more faint close to horizon. 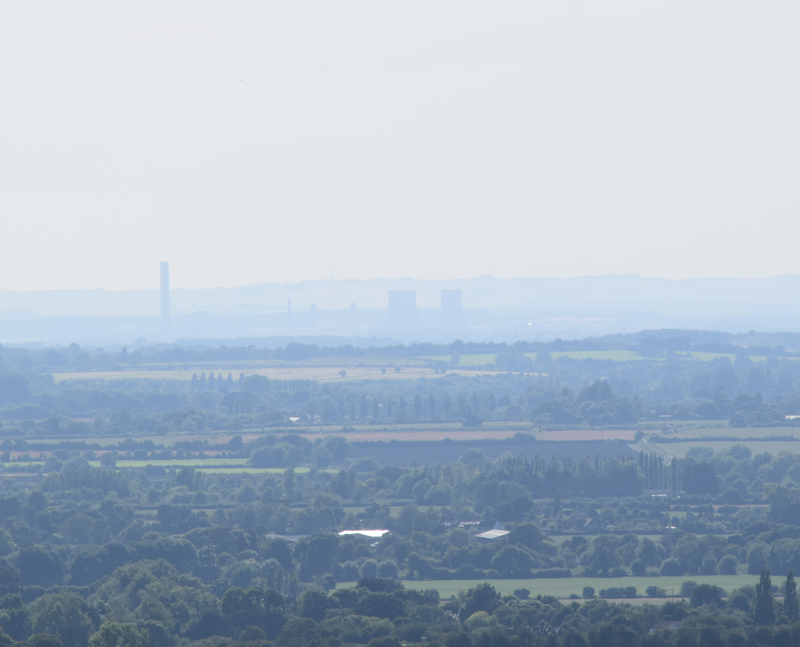 It depends for thickness of the atmosphere, Beacon Hill, Princes Rinsborough. Another thing to considerate is the Rayleigh scattering of sunlight in the atmosphere, which causes a diffuse sky radiation. Diffusing sky radiation refers to the sunlight reaching the Earth’s surface, which previously has been scattered in the atmosphere.The sunlit sky is blue because air scatters short-wavelength light more than longer wavelengths. Situation is slightly different during the sunrise and sunset, when more longer wavelengths are scattered (pic. 2). Pic. 2 Earth’s sky around sunset. More longer (orange and red) wavelengths are scattered, that turns sky into yellowish colour, Długie, Poland. On top of that Earth’s surface also influences to the sky colour. Majority of Earth’s surface consists water (blue colour), from which eventually both the direct sunlight and light scattered in the atmosphere is reflected in blue colour making the sky more blue. Standing on the Earth we can also see the blueness of the horizon and object, that are situated further from us appears like bluish. This is caused by smallish part of the air–tiny hydrocarbon particles relased by vegetation chemically react with ozone molecules, that selectively scatter blue light, giving the mountains, remote objects blue appareance (pic. 3). Pic. 3 All remote object seen on Earth has a blue appearance (bigger or smaller depends on the weather conditions), Chiltern Hills, Princes Rinsborough. Martian sky appears to be different that Earth’s one. 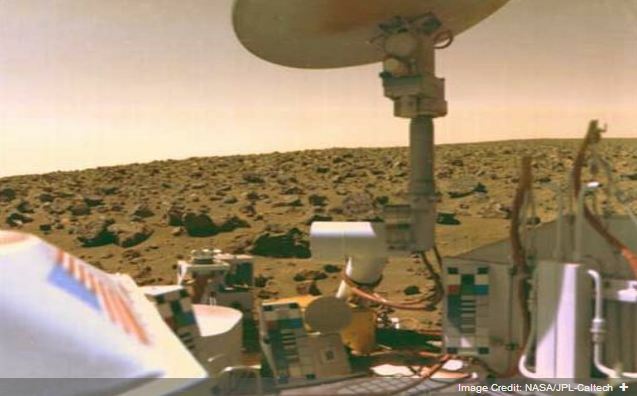 People could see it since the Viking Mars landers sended back a first color photos in 1977. Since that time many photos has been sended back to Earth showing a different appearance of the Red’s Planet sky. Generally speaking is really hard to state exact colour of the Martian Sky. Some images show it to have a red sky, other a butterscotch sky and even, similarly like on Earth blue sky. Taking a full 360-panorama photos by rovers before Curiosity seemed to be difficult, because the rovers couldn’t see the full vista at once. They couldn’t see a whole sky simultaneously. It took a few days to complete the panorama. Rover had to make a smaller pictures and then stick all together. During this time weather could have change and sky would have a different color also. Pic. 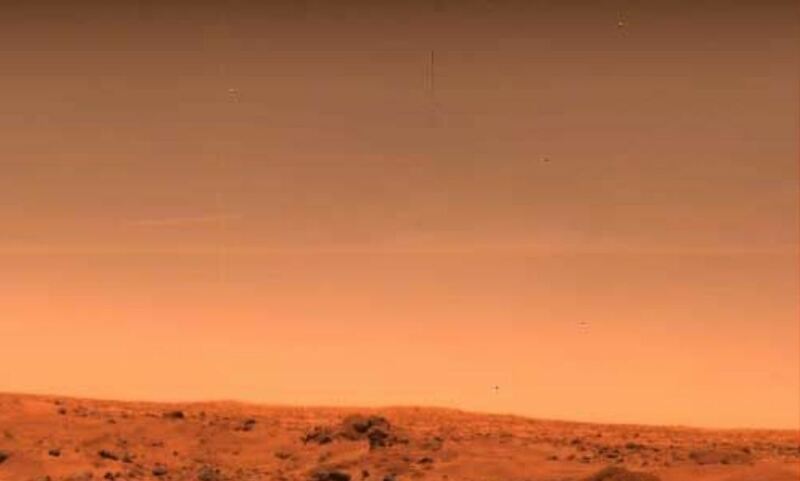 4 A first colour photo from Mars made by Viking displays sky colours from yellowish (butterscotch) to brown, Utopian Plain (mars.nasa.gov). The rovers are able to take pictures using three different primary color filters (RGB) using 14 filters aimed at geological stuff and providing maximum contrast to analyze. Each Rover is equipped with a calibration target. Everything is to be made all photos as much realistic as possible. Moreover each Rover has a photo calibration before left the Earth. Pic. 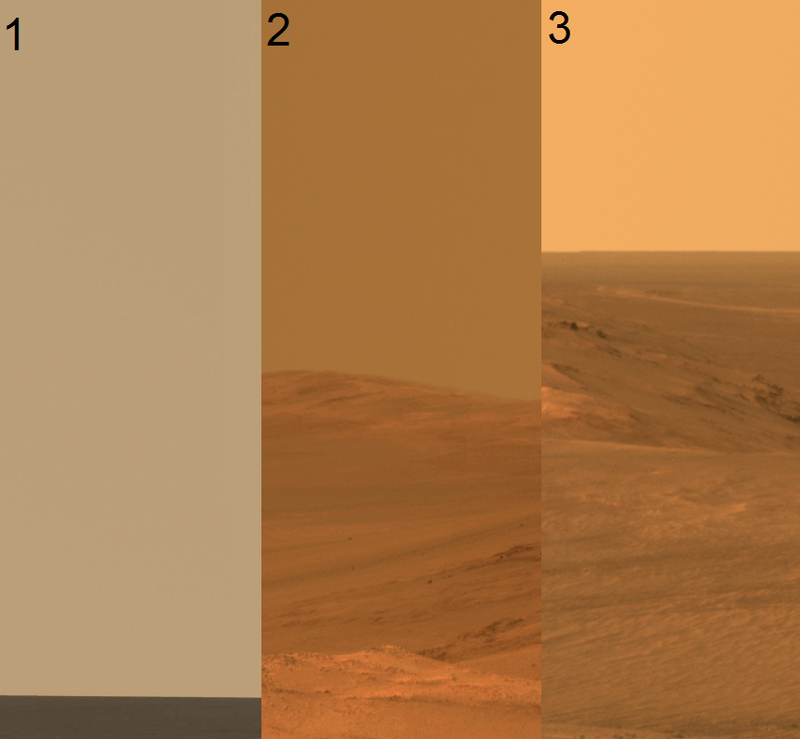 5 Color composite images from Opportunity: a) true color rendering with all 6 visible spectrum filters, b) color rendering using 3 filters (L4, L5, L6), c) color rendering using 3 filters (L4, L5, L6) with average normalized sky spectrum, d) average splined spectrum using all 6 filters. (Bell et al. 2006). Aforementioned graph shows the photo rendering possibilities for the Opportunity Rover, which is equipped with 6 photo filters. Below you can see the example of pictures done by using different color rendering. Pic. 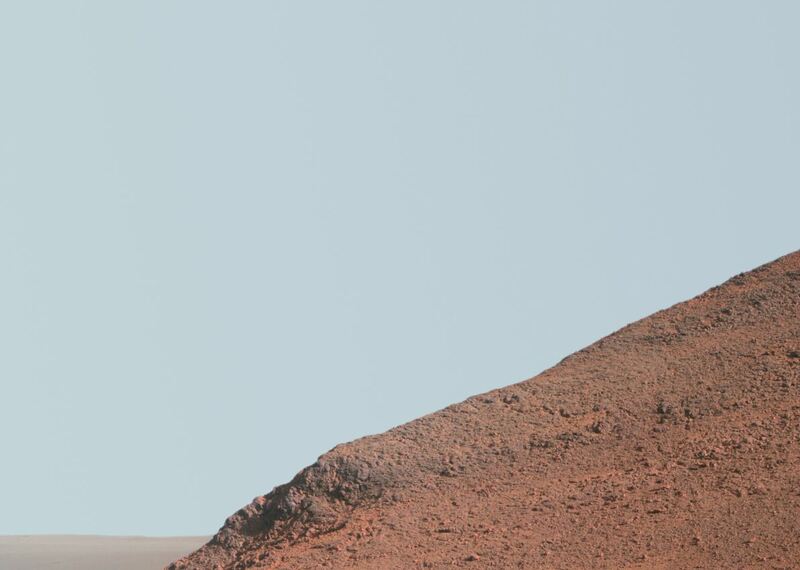 6 Martian sky covered by Opportunity rover in different color rendering: 1 – The Lion King Panorama, true colors (pic. 5a); 2 – The Endevour Crater rim from ‘Murray Ridge, color rendering with 3 filters (pic. 5b); 3 – The Endevour Crater west rim, color rendering with 3 filters + normalized sky spectrum (pic. 5c) (mars.nasa.gov). Unlike to Earth Mars has an atmosphere dominated by dust, which produces a bright orange and red sky colour. The redness increases toward the horizon during midday time hours.On the contrary to Earth’s conditions Martian sky seems to be the most brighter in the zenith. It may be caused by suspended atmospheric dust. Those micron-size dust aerosols causes the bluish glow of the sunset also. The Martian dust absorbs blue light more strongly that red. We can see it especially when the Martian sun is low above the horizon. A bluish glow surrounding the sun around sunset is created by light scattered at small angles by dust particles. The glow with blue ting around the sun appears also during a dust storms. In general the blue glow should follow the sun as it’s traverses the Martian sky from sunrise to sunset. However, it will be most intense during sunrise and sunset due to the increased optical path length through the atmosphere. Blue light’s intensity dominates dust for scattering angles up to about 28 deg with the greatest dominance of angles up to 10 deg (pic. 7). The dust particles, that dominates the Martian atmosphere are much bigger than aerosols exists in Earth’s atmosphere.The radius of dust particles is close to the wavelength of visible light. For this big particles there is no simple law analogue to Raleigh light scattering law. Scattering for these particles is sensitive to size, shape and composition. Blue sun and moon may appear on Earth also, but it can be seen very rarely, mainly during the volcanic eruptions, when bigger particles of dust are emitted to the atmosphere. Pic. 7 Martian sunset seen from the Gusev crater and captured by Spirit rover in 19.05.2005. The photo shows the blue light scattering up to 28 arc degrees from the Sun. The biggest effect of bluish light is to be seen 5 arc degrees directly above the Sun, what was related with a big density of dust in the Martian lower atmosphere for that time being (Ehlers K, et. al. 2014). Pic. 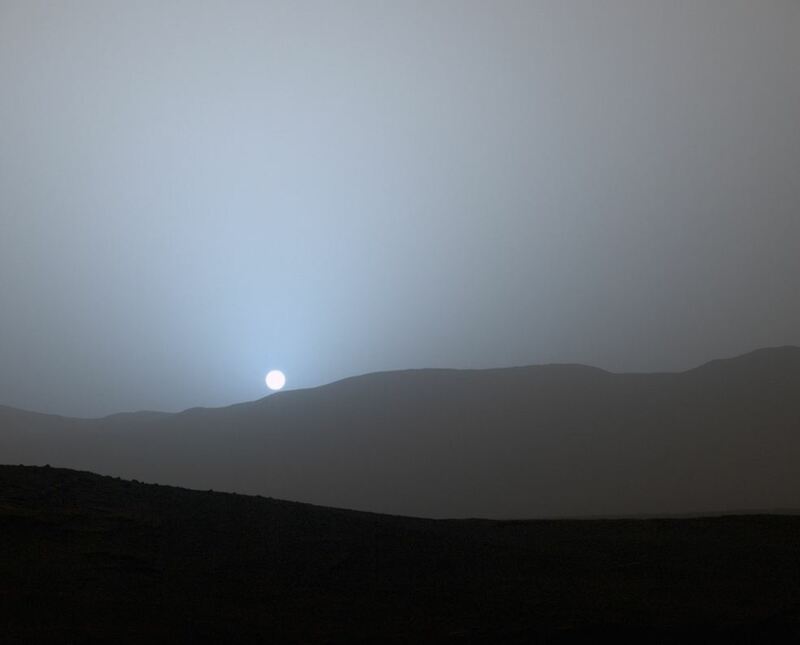 8 The Martian sunset above the Gale crater, captured by Curiosity rover. The higher detailed picture shows exactly the same effect, however the dust density seems to be bigger than on previous pic.7. Moreover the mountainuous area doesn’t show the true horizontal line, hence the bluish tinge is the best noticeable just above the Sun (looks like plume). The Sun direction has been zoomed in (mars.nasa.gov). Pic. 9 For the first time the Martian sunset has been captured by Mars Pathfinder in 1997. This picture clearly shows the same bluish light scattering effect with another sky color variations above Twin Peaks. In all 3 cases (pic. 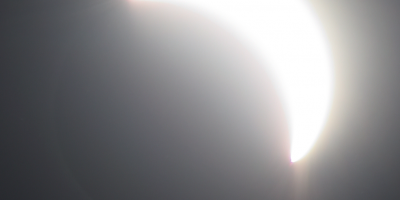 7,8,9) Sun appears like white circle with bluish outline (mars.nasa.gov). Twilights on Mars lasts for a long time, becouse of the dust density in the atmosphere, which perfectly scatters the sunlight. 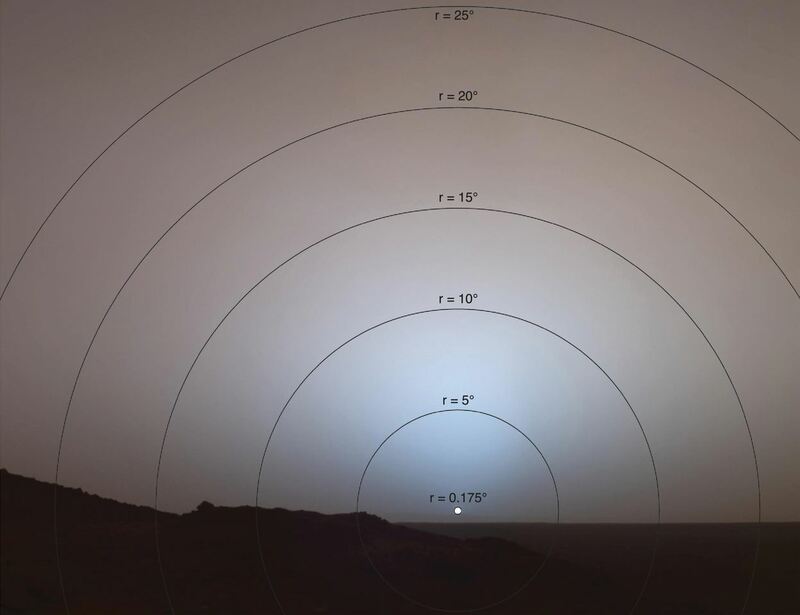 During the low dust level the observer would be able to see Martian clouds on the sky. There are very faint clouds, which looks likewise a noticulent clouds seen from the Earth’s surface. Those clouds are higher than every clouds on Earth – up to 100 km. The clouds are most likely made of carbon dioxide and can be seen reflecting the sunlight against the darkness of the twilight sky, making it more violet (pic. 10). Pic. 10 Martian twilight sky with dioxide carbon clouds, making the sky more violet. 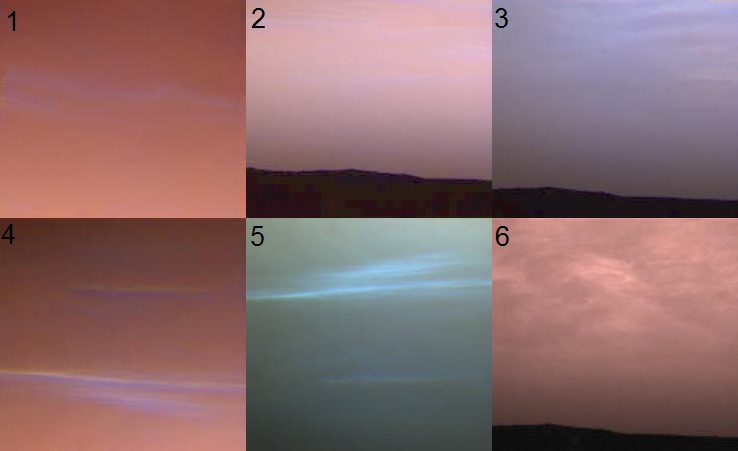 All images done by Mars Pathfinder in 1997: 1 – Pre-dawn clouds over Mars, 2 – Pre-dawn Martian sky, 3 – A violet Martian sky, 4 – Whispy blue clouds, 5 – Dry ice clouds 30 deg above the horizon, 6 – Pink “stratus” clouds (mars.nasa.gov). 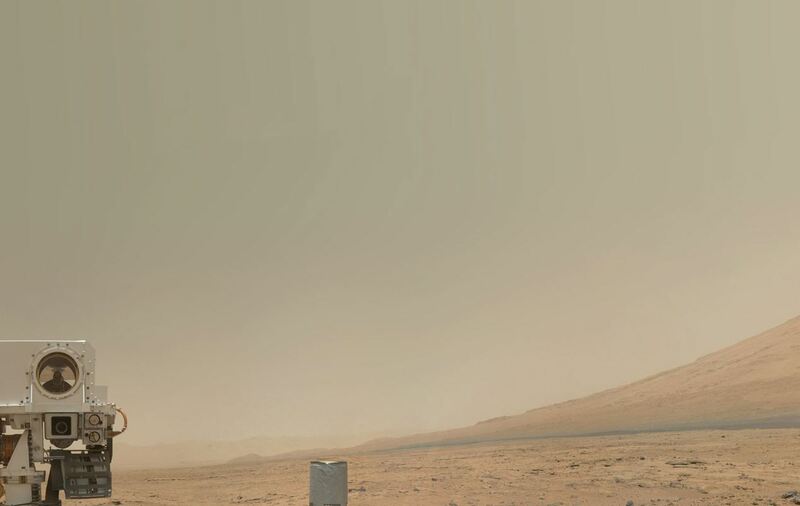 There is a much variations of the Martian sky due to the level of dust influence. There are huge dust thunderstorms, that may cover a continent-size areas, which may last even a month. During that weather the light level drops quickly and sky color turns from butterscotch to reddish, even brown (pic. 11). Pic. 11 The thunderstorm coming on the Spirit rover area in July 2007. In the span of tens minutes the sky became dark and brown. The Greek letter tau shows the atmosphere opacity factor when thunderstorm coming. 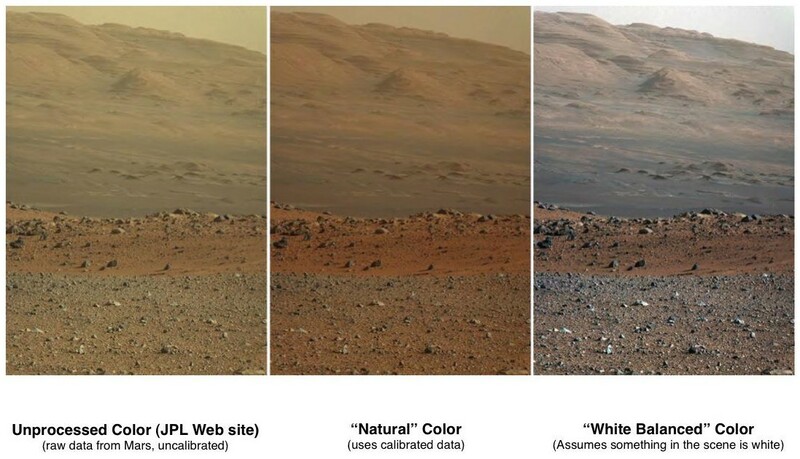 Light level is reduced dramatically and the ground becames invisible (mars.nasa.gov). Those huge dust storms are caused by winds. Aside for winds, generated by difference of the heating up the surface and especially by trade winds, that exist at low altitudes. At higher latitudes a series of high and low pressure areas dominates the weather. Because Mars is much dryer than Earth, and in consequence dust raised by these winds tends to remain in the atmosphere longer than on Earth as there is no precipitation to wash it out. Pic. 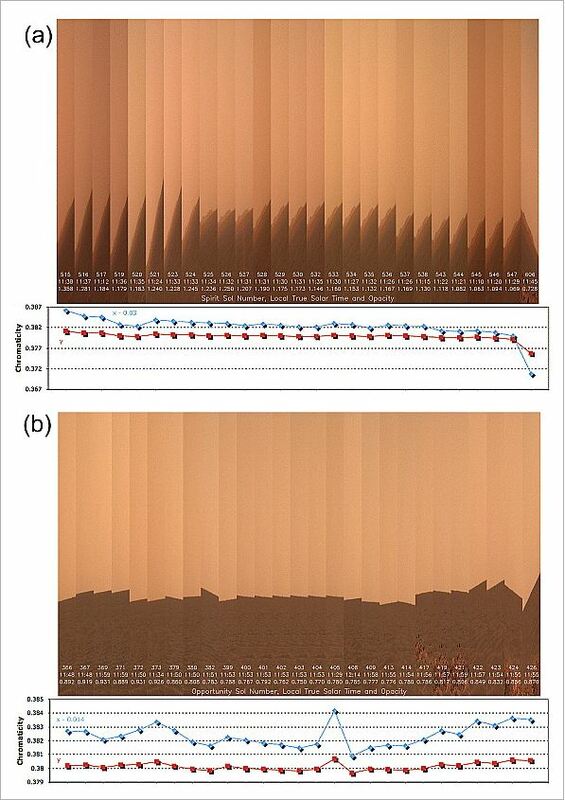 12 The Spirit rover sky photo sequence showing the relative color changes of the Martian sky in time. The survey had been carried out for 35 Martian days (sols) for picture A and 60 Martian days (sols) for picture B. During the days with better weather conditions you can spot, that sky closer to zenith is darker. 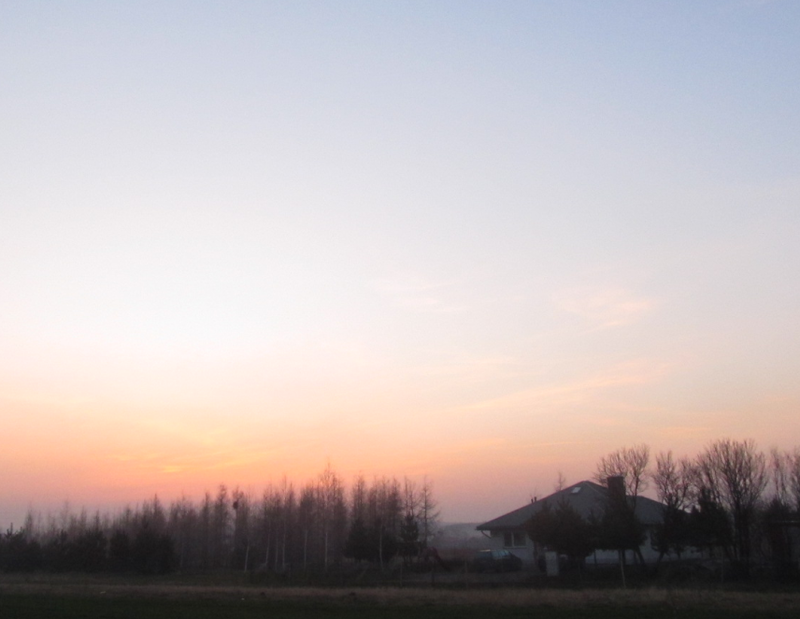 In other cases the hue seems to be constant or sky looks slightly brighter higher above the horizon (Bell et al. 2006). The color of the Martian sky changes due to the arc distance from the Sun, likewise on Earth and different planets (pic. 13). Pic. 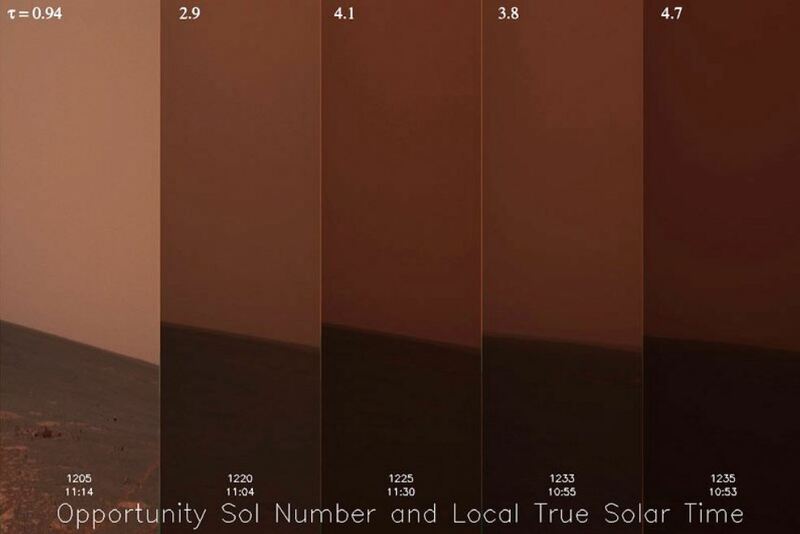 13 The color variations of the Martian sky due to spherical distance from the Sun. 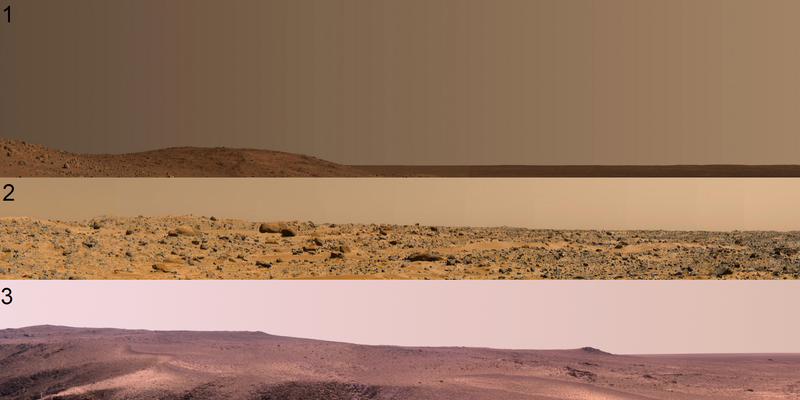 Usually sky looks brighter when closer to Sun: 1 – Spirit rover near ‘Husband Hill’, 2 – The panorama of Mars by Mars Pathfinder, 3 – The panorama of Rocheport by Opportunity rover (mars.nasa.gov). When rovers doing the 360 degrees panorama it takes time, even a few days. During this time the weather conditions may change significantly. See this situation below on the Curiosity 36 deg self panorama (pic. 14). Pic. 14. 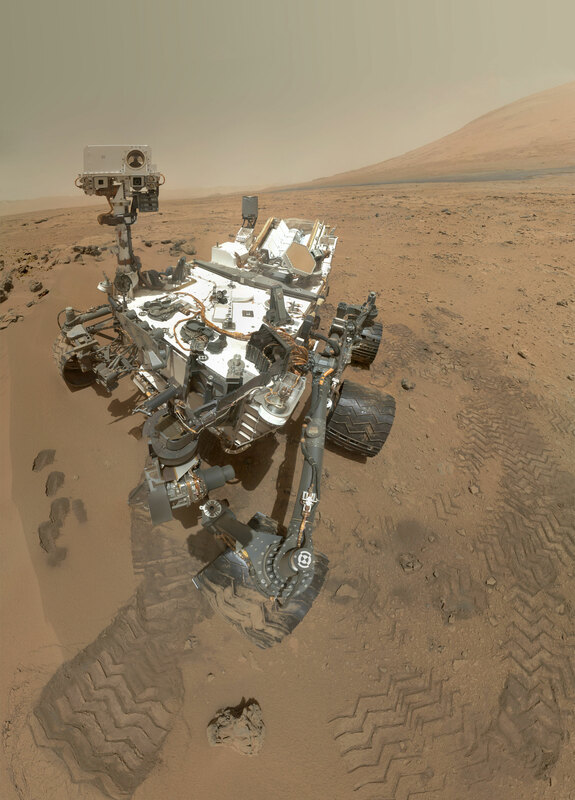 The Curiosity rover low angle self-portrait with 360 deg panorama. See the sky color variations from butterscotch on the right through dark in the middle to reddish on the right. It means, that when rover was making the panorama the weather condition changed (mars.nasa.gov). Pic. 15 Another example with various colour and hue of the Martian sky seen on the Opportinuty white balanced) – a Bilion Pixel View on Mars (mars.nasa.gov). Pic. 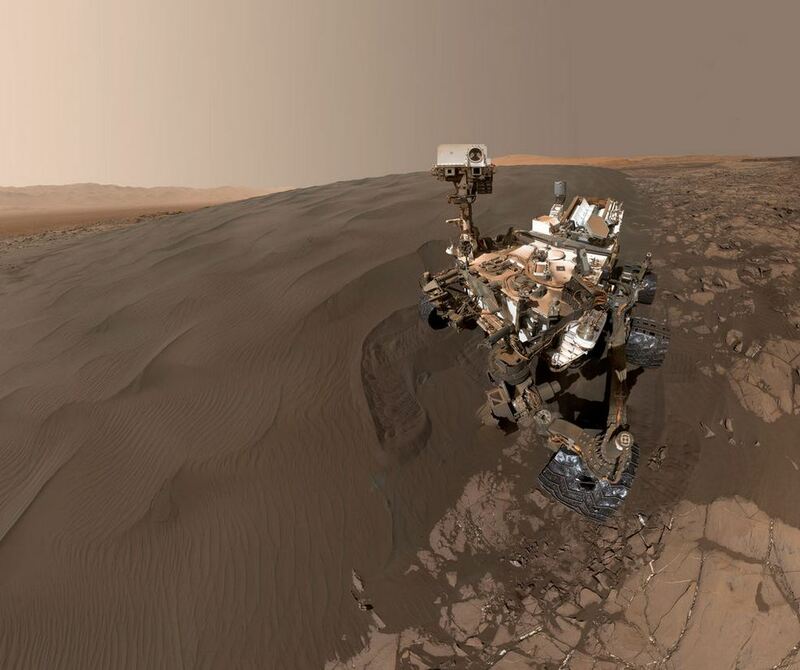 16 The Curiosity self-portrait at ‘Murray Buttes’ done probably during more stable weather conditions (mars.nasa.gov). Pic. 17 The sky above Martian ‘Cape Tribulation’ near Endevour Crater made by Opportunity rover (mars.nasa.gov). Pic. 18, 19 The Curiosity rover 360 deg panorama on ‘Murray Buttes’: 2 sections showing color of th sky: 18 – close to the Sun (white-butterscotch), 19 – opposite side of the Sun (brownish) (mars.nasa.gov). Pic. 20 The ‘Twin Cairns’ Curiosity panorama shows the same effect, although it looks faint, probably becaouse of the different color rendering. Pic. 21 The Mount Sharp panorama in white-balanced colors made by Curiosity rover shows the blue sky, however there is no difference in hue between above-the-horizon sky and zenith sky (mars.nasa.gov). Pic. 22. A various Curiosity picture color rendering, Mount Sharp (mars.nasa.gov). Pic. 23 The white-balanced picture of the Curiousity rover landsite (pic. 22c) (mars.nasa.gov). Pic. 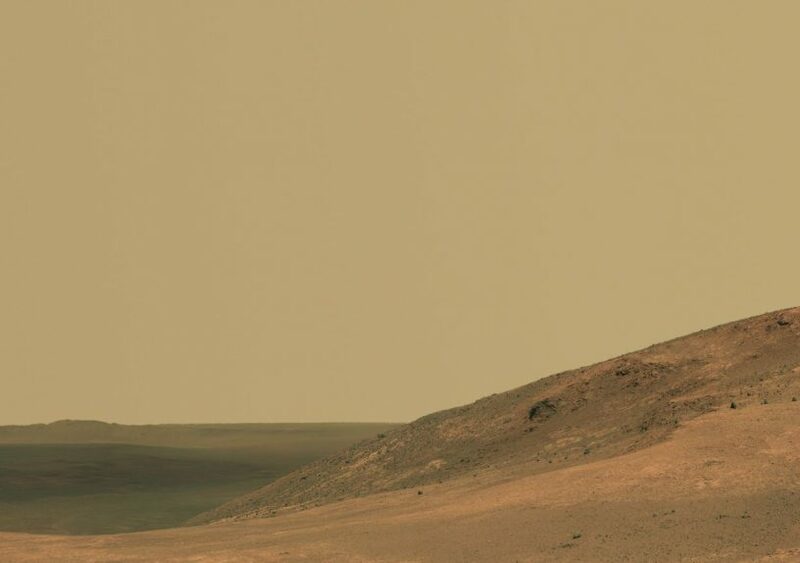 24 The panorama of ‘Marathon Valley‘ made by Opportunity rover, unprocessed colors (mars.nasa.gov). Pic. 25, 26 Northern portion of Gale crater rim viewed from ‘Naukluft Plateau’ – picture made by Curiousity rover shows the emphasized bluish effect, which is bigger when looking closer to the Sun (upper picture), on the opposite side the sky has mixed tinge with bluish, dark and brown (bottom picture). Pic. 27 The ‘Knudsen Ridge’ captured by Curiousity rover with enhanced colors shows bluish sky with constant hue (mars.nasa.gov). Pic. 28 The Mount Sharp captured by Curiousity rover with white balance effect, tht compensates the blue color absence and making the sky appears more blue (mars.nasa.gov). However the most important for us are images made in true color rendering. When there have been no recent storms the sky should be blue. According to photos provided during the best weather conditions the sky is to be seen like bright butterscotch near the horizon through yellow green to darkgreenish-bluish near the zenith. Should we believe that this sky color is right?. Greenish hinge is to be noticed on some photos, but I think that we need to treat it like something between dark blue and fair butterscotch. Because Mars is extremely dry there , dust may be suspended in the atmosphere for a very long time. Even then, when the dust level is possibly the lowest can still affect for the color of thesky, making it mixed with blue and butterscotch, which may result some greenish himge. See the picture below (pic. 34), which shows true Martian sky colors during the low dust conditions. The sky looks similarly to this, seen on Earth’s surface. This picture brings us the answer for the question: How would the sky color change as the dust opacity decreases, hypothetically all the way to zero dust? Pic. 29 The Mars Pathfinder picture, captured during lower dust conditions, where the horizontal sky appears to be slightly brighter (mars.nasa.gov). Pic. 30 The true colors Twin Peaks image made by Mars Pathfinder in 1999, showing the sky during low dust conditions. Upper part of the sky looks a little bit greenish, horizontal part has a butterscotch color (mars.nasa.gov). Pic. 31 The Big Joe in the Chryse Planitia captured by Mars Pathfinder. The image clearly shows the sky with a thin dry ice clouds. During that weather conditions sky was looking from butterscotch near the horizon to dark near to zenith (mars.nasa.gov). Pic. 32 The Curiosity rover made a picture, which shows a sky during a fair weather day. The hue of the sky is dark greenish (mars.nasa.gov). During the low dust conditions Martian sky is to be blue. The Rayleigh scattering will play a main role in this case. This light scattering effect will be much weaker than in Earth’s conditions because the Martian atmosphere is much thinner. Observer being on the Mars surface would see the faint blue-butterscotch or greenish-butterscotch sky near the horizon and dark blue sky near zenith. Besides the Mars surface is reddish, so it must reflect a reddish light only. This light should also influence on color of the Martian sky. Taking into account the thickness of the Martian atmosphere the sky near to zenith would look much darker than seen from Earth, possibly the stars would be visible during the day. I think that we can compare a zenith Martian sky to zenith Earth’s sky when we are travelling by plane at around 10 km altitude. We need to know that aside of rare atmosphere the big role plays a distance between Sun and Mars. Mars average distance from Sun is around 230 milion kilometers (1.52 AU), around 80 milion kilometres further than Earth. 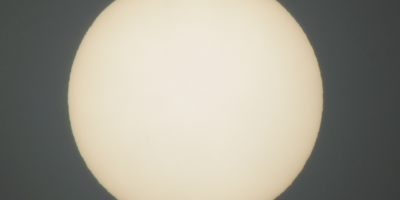 It means, that our host star appears to be apparently smaller giving a smaller amount of light at once. Basically the solar disk seen from Martian surface consist around 5/8 size as seen from Earth (around 21 arc minutes diameter). According to the inverse square law Mars receive only 40% light distributed to Earth. To imagine this light level is good to compare it with slightly cloudy late afternoon on Earth or partial solar eclipse day with around 60% obscuration. Obviously it apply to the midday time hours in low longitude areas where Sun rises up near zenith. For morning, evening and polar latitudes this light appears to be weaker especially during the huge dust storms. Consideratingthe fair weather conditions with pristine sky, the atmosphere absorption effect would not be noticed in the Earth-scale, because Martian atmosphere is nearly 100 times thinner than Earth’s therefore it should not impact the luminance of this planet. This is only theory. As I wrote above Martian atmosphere must be completely free of dust so the light absorption appears to be bigger. In the low light level conditions, that may be common throughout the Martian day with thick dust the Purkinje effect may play a big role. Pic. 33 The Curiosity rover self-portrait shows quite dark image. During Martian days with high level of dust, the Purkinje effect may play a role (mars.nasa.gov). The Purkinje effect says us what is the human’s eye response to color in a different level of ambient light: for instance red objects appear to darken faster than blue objects as the level of illumination goes down. Pic. 34 The Curiosity color view picture showing Martian sky during probably the best weather conditions. We can notice, that a visibility is quite good, making in effect a pristine clear sky with Rayleigh scattering influence. Sky appears to be yellowish-greenish just above the horizon and dark bluish upper with some greenish elements. 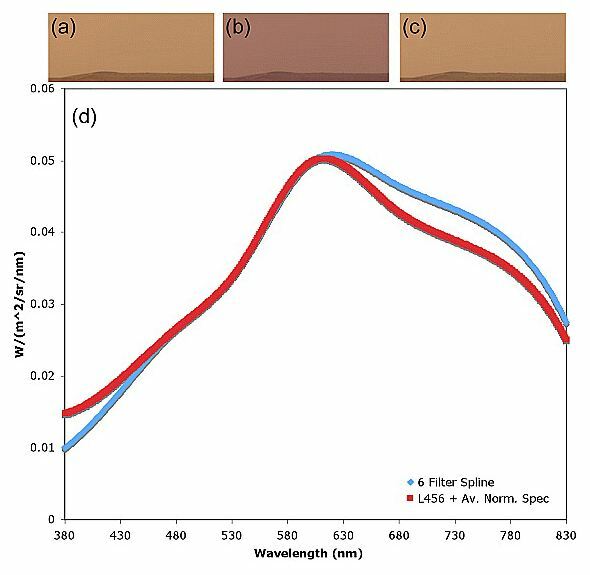 Those greenish elements may be a result of the mixing between light scattered in the Martian atmosphere (Rayleigh scattering) in short wavelengths (blue) and light reflected by Martian surface (reddish). 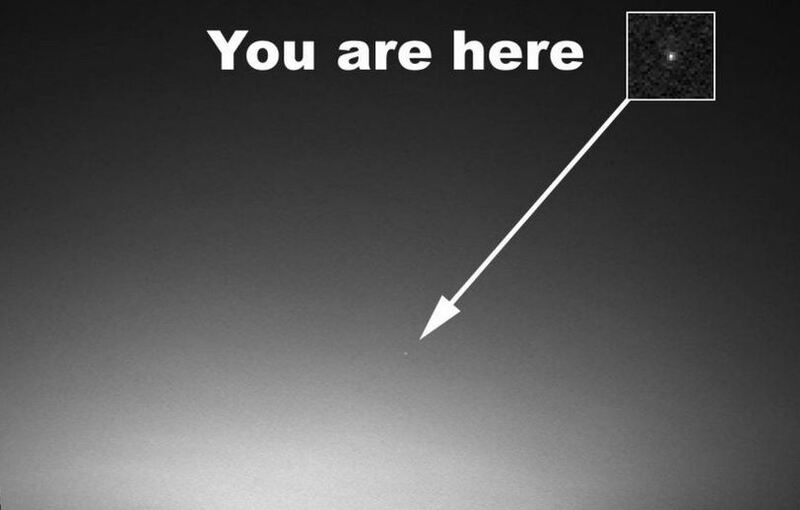 This photo gives probably the answer about a clear Martian sky without dust (mars.nasa.gov). There is much variations in the color of the sky as reproduced in published images, since many of those images have used filters to maximize their scientific value. For many years the sky on Mars thought to be more reddish than it is now believed to be. The newest images and measurements shows, that sky colour properties may significantly differ due to weather conditions. All studies about the Martian sky may have a significant impact on future human missions to the Red Planet. The unique sky colour differing so greatly from reddish-butterscotch to bluish-black may provide some psychological or physiological effects on astronauts. Possibly during the fair weather conditions the stars would be visible during the day, especially around sunrise and sunset. To know much more details we have to wait for forthcoming space missions, which will provide us better photo documentation. Pic. 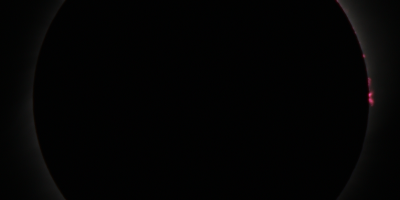 35 Planet Earth seen from Mars. This is one of the most prominent objects on the Martian evening & morning sky (mars.nasa.gov). Bell J. F. et. al., 2006, Chromacity of the Martian sky as observed by the Mars Exploration Rover Pancam instruments, (in:) Journal of Geophysical research – Planets, vol. 111, Issue E12. Ehlers K. et. al., 2014, Blue Moons and Martian sunsets, (in:) Applied Optics, vol. 53, Issue 9, 1808-1819. Thomas N. et. al., 1999, The color of the Martian sky and its influence on the ilumination of the Martian surface, (in:) Journal of Geophysical research – Planets, vol. 104, Issue E4, 8795-8808. Why the sky on Earth is blue?